A “babymoon” is a somewhat new concept, but is totally worth it. It’s a chance to plan out one last vacation before a newborn turns your world upside down. So where can you have the best babymoon in the US? I say, Vegas! Getting straight to the point, Vegas is preggo friendly! We had such a great time. From the service to the food, the attractions, shows and deals, they’ve got all you need. There is still plenty of fun to be had without drinking. Not to mention, I actually felt relieved to temporarily trade Houston’s sweltering humidity for Nevada’s dry heat… call me crazy. People are drawn to the bump! Cutting lines, being approached by celebrities, getting called to the stage at shows. These are just a few examples of the special treatment I got that almost made me want to stay pregnant… Almost! With all of the legitimate concern about the Zika virus, my top priority was vacationing somewhere with low risk for infection. As recent as June 2, 2017 Las Vegas mosquitos have tested negative for Zika. You can find out more about the Zika virus and infected locations here. When arranging our flights, I asked my husband to give me a couple hours to myself. Of course, I’m not new to LV, as I was blessed to live there during my Physician Assistant Program. I made sure to make a stop at my alma mater Touro University and get some mementos at the book store. My next stops were to pick up slices of my favorite Tres Leches cake from Cafe Rio (#Preggocravings) then head to Jina’s Brow Studio for some peaceful maternity henna. Although it wasn’t my first time with Henna it was my first time getting it on my tummy and man, it takes a good minute to dry! After enjoying my time alone I was excited for my hubby’s arrival. We officially kicked off our babymoon by grabbing a quick dinner at Haus Dog. We then headed to see the Cirque Du Soleil: Michael Jackson ONE show. Let me preface this by saying hubby and I have seen most of the Cirque Du Soleil shows on the strip & loved them, including Zumanity and KA. But this Micheal Jackson show… needs some improvement. At least the hologram was cool (all five minutes it was on stage). Hubby and I slept in until my siblings arrived early that afternoon. I have a couple reasons why I wanted them there but the most pressing was to make some family vacation memories while we still can. Life happens quicker than you realize, and coordinating schedules gets harder and harder. I’m just happy all of us were able to share this time together. While exploring the strip we came across the Tix4Tonight Booth. One of the best discount outlets on the strip. They beat the prices for all the shows we had heard of by at least 30%! We ended up deciding on Mike Hammer’s Comedy Magic Show that evening and tickets to Madame Tussaud’s Wax Museum for the last day. If you want to save even more you can also try Las Vegas Perks here. The Get Hammer’d Show was worth more than what we paid for. His show was hilarious and with such an intimate setting there was plenty of crowd participation. Can’t say I was shocked when he brought me on stage, I’m telling you this bump is a human magnet! Afterwards, we explored Fremont Street Experience and all of its attractions. We decided to grab dinner at The Kitchen at Atomic further down into Downtown Vegas. Last time I was in Vegas I knew Downtown as an area stricken with poverty and homelessness. To my surprise, the CEO of Zappos had completed a $350 million revitalization of downtown. On our way to dinner, our rickshaw driver took us on a complimentary tour downtown to see the collections of murals and installations already in place by the Life Is Beautiful art program. All are in preparation for the huge Life is Beautiful music festival happening Sept 22-24. Click here to see the crazy line up including Chance The Rapper, Blink-182, Pusha T and much more. Fortunately for me, my hands will be full of newborn squishiness but if you get a chance to go, take it! Then let me know how you liked it. When we finally got to dinner my group was visibly exhausted, but I had all the energy to keep going. The new American Fare at Kitchen Atomic was delicious and everyone was pretty tired except for me! I thought I was ready to try my hand at blackjack but that gambling spirit soon left me after losing $100 in 5 minutes. We headed to the roof top Drai’s Pool Party @ The Cromwell. One helpful thing I’ve learned about Vegas is you can always get on a promoter’s list for a pool party or club. They are eager to have the placed packed with beautiful women. I say this to emphasize that if you are a group of guys you will be paying full cover + tip to get in most places. Your best bet is to always tag along with a group of women if you want to get in for the free or at least faster than general admission. Of course the bump attracted the attention of NFL player Joe Haden to come over and congratulate me and hubby on our belly full of blessings, sharing his life changing experience with his newborns. Those are my waist beads hanging out above my belly LOL. The Hubby and I spent the rest of the day on our own, grabbing a bite to eat at Secret Pizza in the Cosmopolitan Hotel. I needed something to replace the aftertaste in my mouth so we headed to China Town for my favorite Taro Cream Green Tea at Kung Fu Tea House then popped over to the foot spa for a relaxing full body massage. I was in heaven! After a private dinner at Joe’s Seafood Prime Steak & Snow Crab, we headed to the Marquee Club at the Cosmopolitan. I would be lying if I said pregnancy fatigue didn’t kick in at this point; I was at that club long enough to walk around once, then headed straight back to our hotel. At the end of the trip I returned back to my little Goz exhausted but content. I missed him,but having some adult time was truly a blessing. Now to start nesting for this new little one on the way. What are your favorite things to see and do in Las Vegas? Would you consider a Babymoon there? Previous Post I Quit Blogging, But I’m Back! 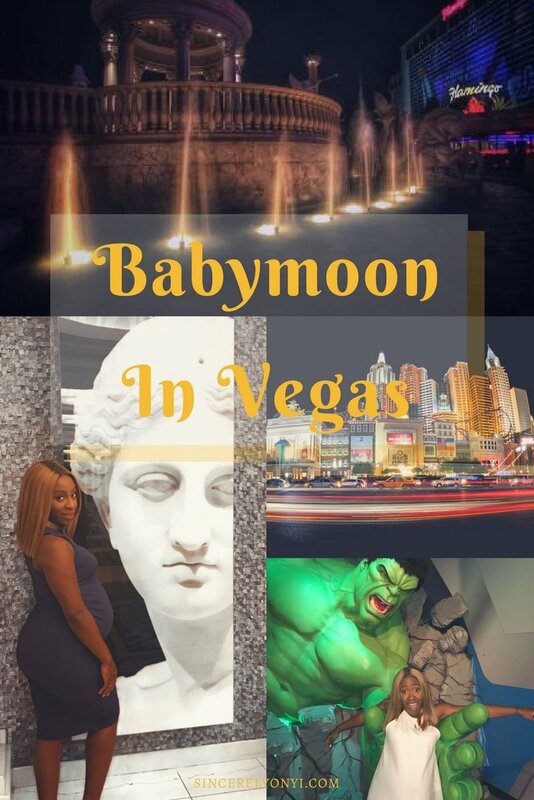 I love the idea of a babymoon. I’ll keep this in mind for next year! Sounds like you had fun! I love Vegas, but my husband hates it. I can only convince him to go if there’s a show he wants to see. Yeah it was very hot, I mostly tried to stay in doors(or uber) but we did have to do some walking. Dry heat is different than Im used to. EVERYTHING about this post make me happy! I would never have thought of this, not in Vegas – but how wonderful!! I’ve always wanted to try henna! It looks like fun, and you look like you had a great time in vegas! Aw, I love that you invited your siblings on your babymoon! looks like you guys had fun!